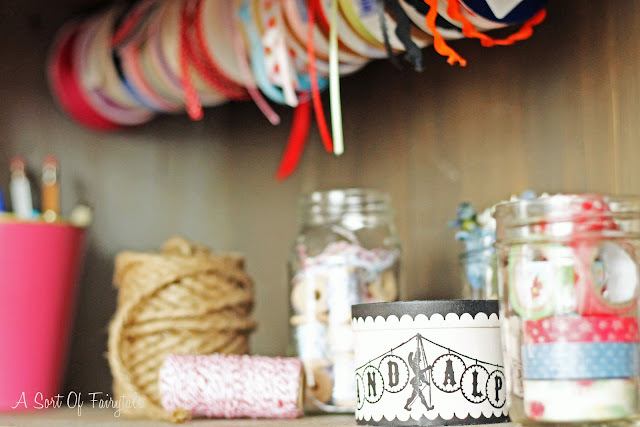 The other storage...jars, baskets, and boxes, I also already had on hand, hold all the goodies to create with! 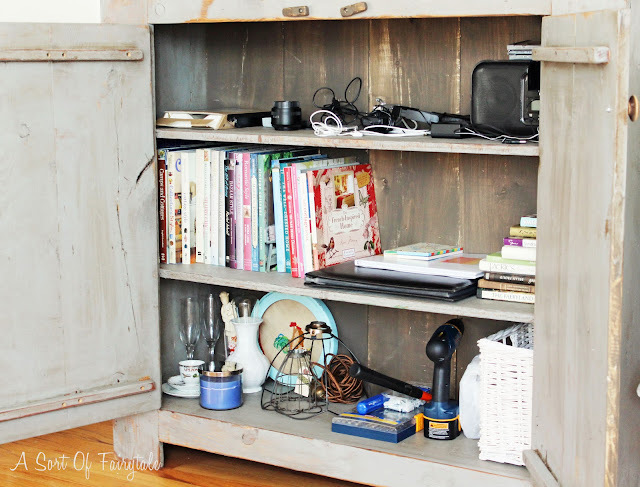 My living room and dining room are connected and this cabinet makes it easy to just grab what I need while working at the dining table, and if it gets messy in that cabinet, I can just close up the doors! My sewing machine, supplies, and fabrics are in the laundry room in the basement...not pretty, so I'm not showin' ya...but it's a fine utilitarian space to work in. 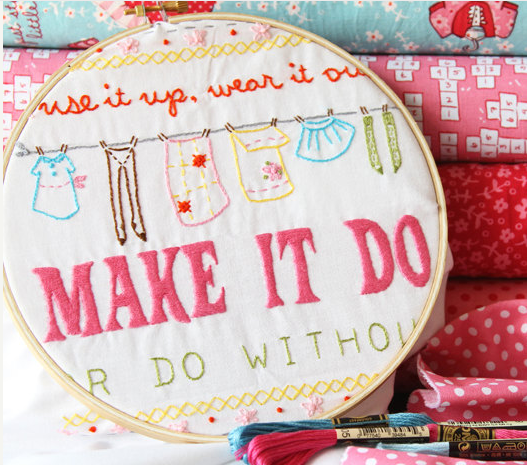 "Make It Do or Do Without", I say! 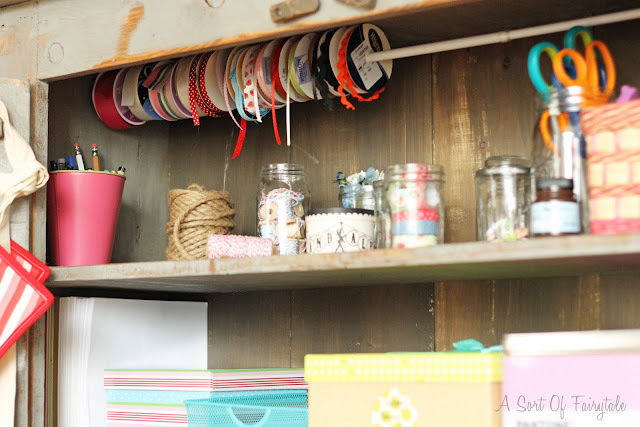 Don't rule out your tiniest of spaces to store your craft and/or sewing supplies, see what you have already that might make a good storage solution. A closet? 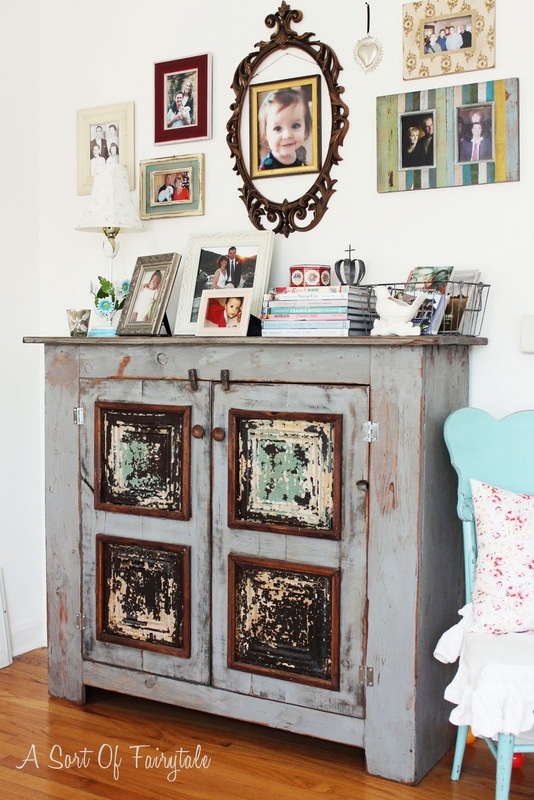 Armoire? Bookcase? This is adorable! I have a feeling my future craft room is going to have to be super compact! Thanks for the inspiration! I LOVE your cute craft cabinet! I have that same Cath Kidston washi tape! Love it! This is amazing!! I love your craft cabinent!! Even with the doors open it looks gorgeous! My friend Claudia has hers basically on a landing at the top of her stairs. So I know it can be done in a small space. I love that cabinet! 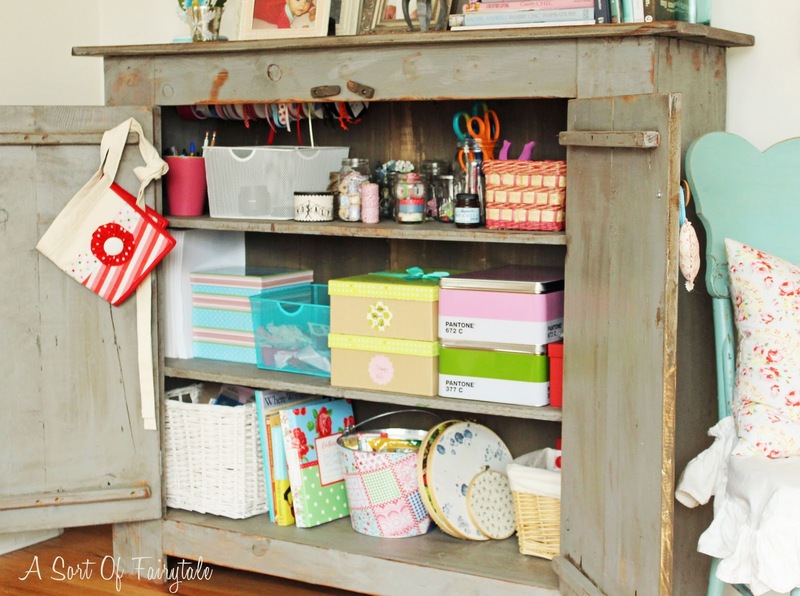 Isn't it amazing what stuff we collect and then clean it out, and you've got a perfect storage spot for your crafting? I like the ribbons too. I'm amazed that the inside of your craft cabinet can look so cute! So nice and colorful! I desperatly need the get my supplies organized. They are such a mess right now and it's so fusterating because I can never find anything. Love your craft cabinet! I always thought that I needed a seperate space to do my crafts too...I always find myself sitting at the kitchen island!! LOVE that craft supply cabinet! I love it! 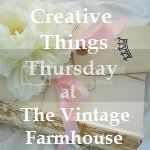 I am in desperate need of a craft space. that looks great, stacey! i love the ribbon holder! The cabinet is to-die-for!! All your craft supplies make it pretty enough to keep the doors open. Looks fab and reminds me that I have a little book shelf that would be perfect for craft storage! Great idea. I love the cabinet and how organized it looks! fabulous post! i have ribbons on a tension rod, too and i love it. everything is displayed beautifully (kaari meng would be proud) and it's always fun to get a peek of your sweet home and cottage-cool style! You are so organized! That looks great and what you did with the rooms makes sense. I went the other way when we moved a few months ago from a small table in our garage and a craft closet to having a little room for my craft/sewing room. I love it and it's out of the way of the rest of the house, too. I love your creative space (BTW....I have those same letters and I love them)! Thanks for the inspiration! I love it. It's such a great old piece closed, but so cute and inspiring open! It's true about where we work. 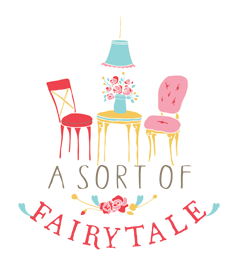 I have a great craft room in my basement, but ALWAYS end up working at the kitchen table! BTW, loved the purse finished. Very cute! Stacey! This is so fantastic! You have shown that it is possible to have storage that is beautiful and functional and the ribbon on the tension rod is so great. 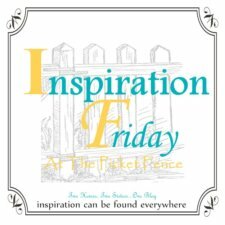 Thank you so much for sharing this at Inspiration Friday! Ooo that cabinet is lovely!!! Glad I popped by too, you've got a fantastic blog! I love the cabinet, and I love the ribbon rack! I'd love to have something like this..how cute! I love your craftiness! I love this idea Stacey! I have a cabinet in my living room that is underutilized too. Now I know exactly what to do with that space. Isn't it funny how we all seem to gravitate to the dining room table? Love your cabinet and it looks GREAT. I love your craft cabinet, and all of the goodies in it! How cute, and organized. This is what I need to do, but mine would have to use a bookcase that is full of.. this and that.. you look pretty organized! Don't feel bad about using the laundry room, my crafty spot is kinda in a corner of the familyroom, next to computer and book case. I just keep getting distracted by people with neat little blog post! Oh I LOVE it! I need to organize my stuff....STAT! By the way, I keep missing your posts and blogger is p*ssing me off! lol I tried to change your url on my blogroll side bar, and what it ended up doing is removing your old wordpress blog url, but when I tried adding your blogspot url onto my blogroll - It Won't Save! And that goes for any other blog that I try to add! Does this happen to you? I'm so annoyed! I tried using another browser to make the changes, etc. but No. Can. Do. It still does NOT save my changes! :/ Help! lol Anyway, hope all these glitches get fixed and did you know GFC will be phased out soon? Ok, now I am officially rambling... lol Soooo, love your craft cabinet! I need me one. Oh wait, I need a sewing machine first! :) Have a great Super Bowl Sunday! You cannot currently walk in my office/craft room since I drug out all my fabric a few days ago for a project and have yet to put it back in the armoire that houses my fabric stash! Your fabric in embroidery hoops reminds me I need to make some quick-and-easy fabric wall art. I have always wanted a craft room, designed just to do my projects and art work. Your craft room is wonderful, and the cabinet really organizes everything. Oh my, I posted about my craft bookshelf in December...this makes me think I need to add doors to it. Love your space!! Thank you very much for your information, nice job keep it up. interesting post. Now you can use this importers directory to promote crafts supplies import & export business.